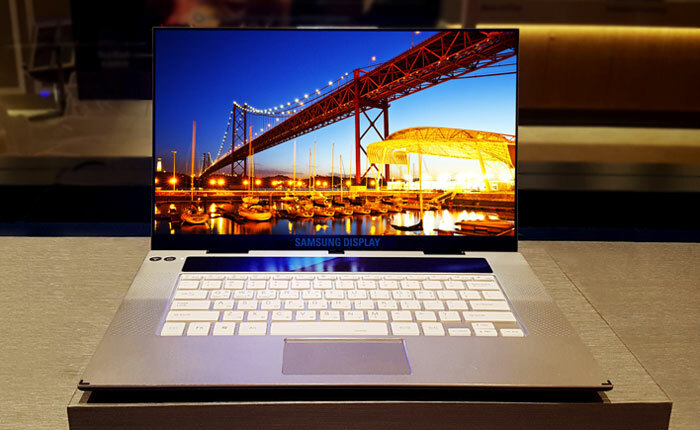 Samsung Display has been showing off a new laptop display panel which it claims is a world first in the market. The new display is a 15.6-inch UHD (ultra-high definition) OLED panel designed with HDR support and premium bezel-less laptops in mind. Though it had a sample display built into a working laptop chassis to show off, mass production isn't set to start until mid-February. 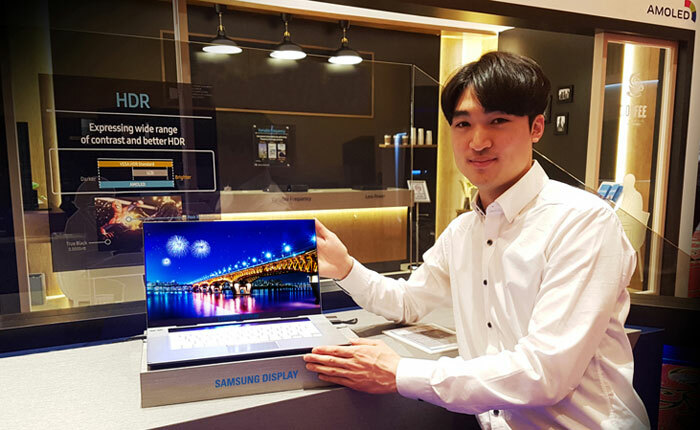 Jae-nam Yun, head of the marketing team at Samsung Display, summed up the attractions of the new OLED laptop display panel as follows; "Our 15.6-inch UHD OLED panel provides the most suitable display solutions for carry-on IT devices with outstanding HDR enhancements, unparalleled colour reproduction and much-improved outdoor visibility. We have no doubt that our new OLED display will offer a much superior visual experience to notebook users worldwide". Thankfully Samsung Display provided some more tech specs for its new 3840 x 2160 pixels display. The display can provide a spectrum of 3.4 million colours for more life-like images. Colours meet the DCI-P3 standard, with the gamut fully covered by this display's capabilities, meanwhile "emitting significantly less blue wavelengths," which is an important consideration for eye health. Recently HEXUS wrote about the new DisplayHDR True Black specification from VESA, and this pane is certified to this standard too. The panel features a brightness level ranging from 0.0005 to 600nits, and a dynamic contrast ratio of 120,000:1. Samsung compares this t a 'typical' LCD panel, saying the new 15.6-inch UHD OLED display delivers black colours approx 200 times darker, and whites twice as bright. Samsung doesn't provide any laptop partner names, so we don't know what laptops might be sold later this year as the screens roll off the production lines. Expect top-end Acer, Apple, Asus, Dell, HP, Lenovo, Microsoft and Razer laptops to be among the first to boast of using this display. The real question is how well the panel will cope with relatively static images displayed on PC screens…will burn-in be a problem? In TVs Samsung like us to believe their Qled (quantum dot) technology is better. That's Samsung marketing for you. LED is a transmissive technology, which will never better an emissive technology live OLED, especially when it comes to contrast ratios. I expect burn-in complaints by March. I would have hoped, given how obvious an issue this is, that a press release would have said that they have fixed it and how they have done so. I hardly ever use the maximum display brightness on a laptop, even with an LCD, as I'm rarely in direct sunlight and I prefer longer battery life. It may be that burn-in is a negligible issue for that sort of use case. I'll certainly be looking out for reviews that test various brightness levels as 600 nits just doesn't sound necessary for me, particularly with how deep the blacks are. If it can manage 5000 hours at sensible brightness levels then that'll probably outlast the useful life of the laptop.